A very solid second installment in the Sarnian saga. The story and world are immersive. The characters are complex and varied that feel like very real parts of the world they inhabit. The world created by Musil is as extensive, new and detailed as any in recent memory. I look forward to the next book. Well worth your time. 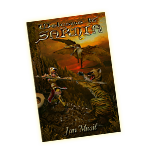 The saga of Planet Sarnia continues with book 2 of Jan Musil’s series about life among the original Sarnians and the aliens who have, over the years, come, conquered and settled this rather hostile land. There have been many successes but those have come with hardship and loss. Living on this planet means cooperation between beings from other areas of the universe or continued hostilities. The Terrans, or humans, must hold their own. The latest challenge is a threat to the aliens on this planet but it is also a situation that is pulling all Sarnian tribes together, threatening the fragile peace, or tolerance between all intelligent beings. A new Taryn has risen within the Golden Sarnians and she must be protected in every way possible if she is to raise her young and increase the Sarnian population. The Terrans devise a plan to get into her caves and destroy her, a task that, even if successful, will likely end the lives of many of the troupe of daring warriors and the others who travel with them for support. It is a long, very hazardous trek, made more perilous by the amazing predators that exist on this planet. Inevitably, the fearless group runs into predators that threaten not only their lives but those of the mules that carry all of their necessities. An attack by a marauding band of aliens and a fierce storm that threatens to wash them off the plateau and down the canyon, force them to use their ingenuity and fierce determination to survive. During the trek, we learn more about the characters and how their thoughts, abilities and experiences help them and their team members survive. My favorite character, Archer Skye Fraser, is a young inexperienced woman who wants to learn and experience everything. There is so much to learn and she is fearless. She also has a great deal of potential, impressing the leaders with her forethought and skill. Jan Musil is certainly a talented storyteller and the main story evolves with fluidity and excitement. The reader really has little idea what challenge the group of warriors will face at the next corner. Jan writes with a great deal of description and is very wordy in his style. I found his first book interesting but difficult to follow with the many branches, from the main story, that he used to introduce us to the planet and its inhabitance. I had to use a story web to follow and organize all of the information. Perhaps it is because I have a better knowledge of his material, but I find book two much easier to follow and much more interesting. I am a visual person and I really like the cover of this novel. I think I got more information from viewing this picture than all of the written description. The odd picture of the different groups on the planet and of the predators that play such a big role in this story would be helpful, either embedded in the novel or placed on his website. Enjoy, it is a worthwhile read. Reviewer: Elaine Fuhr Allbooks Reviews Int. I’ve previously reviewed book one in this series, “Welcome to Sarnia”. My opinion remains much the same. This is fantasy of epic proportions, and very exciting at times, however, Musil is far too wordy in this second volume. There’s a great deal of repeated and unnecessary detail, the writing is still scattered with a steady flow of grammatical errors and an unnecessarily heavy sentence structure. The book needs a heavy copy edit. At half the length this could be twice the book. Some of the multiple other species activities, as they’ve no real bearing on the developing plot, could quite easily be excluded from this volume. Musil has built a fantastic and fantastically detailed world, but we don’t need to be studying the whole planet and every satellite in every book. I feel very frustrated that I can still only give four stars when all this needs to be first class is judicious pruning and a good grammar edit. For the fans of epic world building fantasy, one need look no further. Musil has created such a wonderful landscape populated in a fascinating way, but heck, unless one can skim read and still absorb detail, which I can’t, this is a long read to get not particularly far. independence to their subject races. introduced. This book builds the foundations for an intended long series of stories. has inter-stellar travel capabilities, but we may assume it does. There are a very few humans still alive with distant memories of Earth and space flight, but to all intents and purposes that immediate experience is lost. What of the story, the plot itself? Well, as I have already said, this is just the first stage of a colossal epic saga. Stories within stories are completed but by the last page of Welcome to Sarnia, we are still not far from the beginning of the drama, if this even proves to be the beginning. Musil writes well, but for me, with consideration to the version I read (May 2012), there are a few too many grammatical imperfections. (Authors Note: The 2nd Edition published November 2014 eliminates this issue) They don’t particularly interrupt the discourse, but they are a totally unnecessary irritation. The massive amount of work, the fascinating creativity, is let down by this less than thorough editing. I fully expect a comprehensive revision of the script at some time after this review. fiction/fantasy elements. I think that readers that are drawn into Musil’s world will become loyal fans. battle as to in which chronological direction this planned series will go. This is a book for a long holiday, or for a series of long-winter fireside reads. In other words, this might be one for the sorts of readers that consumed Tolkien, Frank Herbert, or Orson Scott Card novels, rather than one for those that only like the quick fix of a novella, or sharply sculptured standalone stories. considered as a foundation work we can’t help but see a huge potential. Readers, are you ready for a trip to Sarnia? This will indeed be an exciting adventure, one like you have never had before. Once you arrive, you are introduced to an extraordinary variety of wildlife, natives and travelers from other parts of the solar system, who have come, just like yourselves, for an adventure and maybe a career. But this will certainly be a life altering experience, should you decide to stay or just visit. Native intelligent Sarnians are unusual to say the least with their six-legged hairy bodies. The native fauna are no less unusual but huge would be the operative word when talking about the predators. These predators are extremely dangerous and become a major deterrent to active life and business on the single continent that occupies the water world of Sarnia. Toharrians, Humans, Mi’ukmac and Nu’homish have all arrived at different times over the centuries, and captured the existing continent and occupants, each in turn. At this time, they all exist on this planet with an uneasy truce, continuing the manufacturing, mining and agriculture that allow each to live there. Peace is tenuous and the eminent arrival of a new Sarnian Taryn will test the strength of all on the continent. The strongest and best swordsmen and archers will join existing military to kill the new Taryn but they may not have the same success as last time. The Sarnians have improved their fighting skills, military and strategies. They will not be beaten so easily this time. Of the occupants of Sarnia, some will prosper, some will die and for some, life will change dramatically. The story will be told. Every now and again, a reader will sit back and wonder where such thoughts and ideas must have come from to weave a tale such as Welcome to Sarnia. This intricate blending of characters and events is truly a masterpiece. One life blends with the other and each event leads plausibly to another, smooth and flowing. I was awed as I read, wondering at the imagination of such an author as Jan Musil. Jan has included several maps, and a time line to help the reader visualize this planet and its development. The only thing that I would like to see added is a brief chart or summary of the main characters, the tribes they belong to and their objectives on this planet; or perhaps a family tree. My suggestion to the reader is to sit down, curl up and become one with this story. Don’t expect to be satisfied with just this one book. There is more to come from this author and personally, I can hardly wait. Disclaimer: I received this book from the author in exchange for a review. A science fiction novel that takes place in a world where everyone has to explain their thoughts and actions to everyone, even if it’s only in their own thoughts. I liked science fiction that takes place on different planets, especially multiple planets. Welcome to Sarnia only takes place on one planet, but it has some history and a good set up with plenty of opportunity for drama (four races on one planet). There were a large number of characters and I did have trouble keeping track of all of them. The characters themselves were pretty decent, but what I couldn’t stand was how every thought or action was explained in great, unnecessary detail. I felt like I was reading info dumps for so much of the book. I also got annoyed by the constant repetition. The author must have described a character’s lilting voice at least five times in a few pages. I get it. While I did not always understand what was going on (it was hard to tell when it from an alien’s point of view as compared to a human), I did enjoy the intrigue about the alien races and individual characters. Everyone’s certainly out for something. I liked that women were viewed as capable and were warriors along with the men. The main conflict, a taryn, was a conflict that might not mean much on a larger scale or even a global scale, but it certainly meant a lot to the humans. I wasn’t quite sure what a tayrn was, but it will be interesting to learn more about that along with the Sarnians. Perhaps future books will be better since the world has already been set up in this one. In Mankind’s expansion through the galaxy, one of its conquests was the inhabited planet of Sarnia. They ran the planet for about 40 years, until they were beaten by the Mi’ukmac. That was over 130 years ago. Sarnia is a busy place. Before Mankind came, the planet was run by the Toharrians. Several plagues devastated the three indigenous species, leaving large areas of Sarnia’s one continent uninhabited. After the Mi’ukmac took over the planet, they herded all humans into one small area on the eastern edge of the continent. Humans were presented with several good reasons why any attempt to expand their area of residence is a bad idea. Just to make things more complicated, the Mi’ukmac control Sarnia, but they don’t administer it. They handed that to another race, the Nu’homish. Years before, a human rebellion caused the Mi’ukmac to shut off all electric power to the humans, and they show no inclination to turn it back on. Society has therefore regressed to a pre-industrial level. A huge complication is the existence of flying predators (something like pterodactyls) that would love to devour an animal or person. That is why all human habitation, farms and towns, is covered by nets and cables strung from trees and poles. That is why there are no fields of grain (the soil is not good for Earth agriculture) or herds of animals in a pasture. Human houses consist of three levels: the top level is the greenhouse, where the agriculture happens; the middle level is the living quarters, and the ground level is where the animals are kept. The Mi’ukmac are also keeping away any new colonists from Earth. Considering that this is the first of a projected nine-book series, the actual plot may be a little thin. But the author has done an excellent job at society-building. This is a thick book, but, yes, it’s worth reading. Welcome to Sarnia is a flat out great read. Jan Musil’s narrative is delivered in a manner that reminds me of David Brin (A very good thing IMHO.) though it is clearly original. The characters are numerous, original and engaging. The world is well-imagined and thought out, unique and lethal. The environment is a character all its own. Sarnia is not run-of-the-mill Sci-Fi. It is gritty and tough. This is a great introduction to a wondrous world and I can’t wait for the follow on installments. I found Sarnia well worth my time.